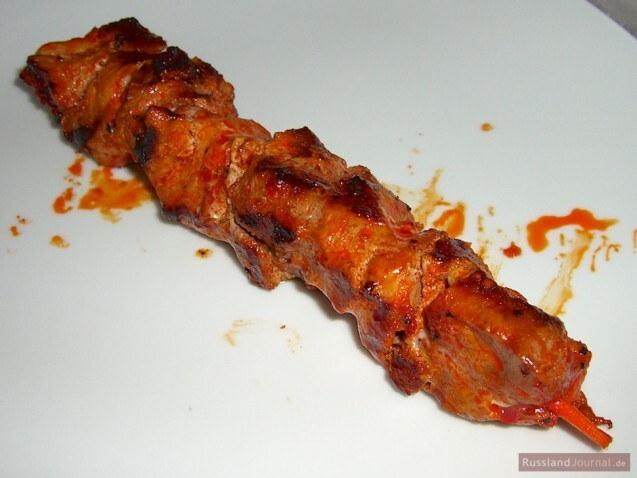 The right marinade is particularly important for shashlik. The acids in a marinade change the structure of proteins in meat denaturing them. It makes meat easier to digest and helps slow the growth of harmful bacteria. In this recipe, lean pork is marinated in kefir. Kefir is a fermented milk drink which is very popular in Russia. Cut pork into cubes (5-6 cm (=2 inches)). Place a layer of pork in a saucepan, follow with a layer of chopped onions. Repeat. Season each layer with salt, pepper and other spices. Pour in kefir and refrigerate for about 24 hours. Slice remaining onions. Thread pork cubes onto skewers alternating with onions slices. Baste with marinade while grilling. Place pork cubes and onions in a saucepan, pour in wine, pomegranate and lemon juice. Season to taste with herbs, salt and pepper. Knead marinade into the meat. Mix oil in (without kneading). Cover and refrigerate overnight or up to 24 hours. Thread pork onto skewers. 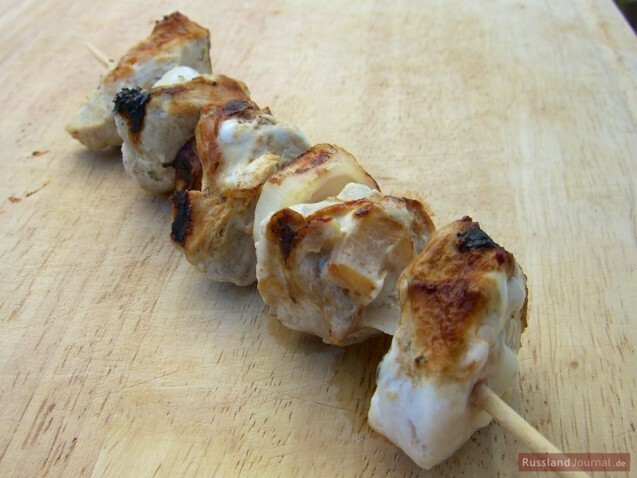 Turn skewers frequently while grilling to cook meat evenly. To juice pomegranate better, roll it between your hands or on a table. Then cut in half and juice slowly using a citrus press. Please note: pomegranate juice stains clothes.